Pleural thickening is a disease affecting the pleura - the two thin membranes which surround the lungs. The disease is typically caused by exposure to asbestos fibres. In many cases this exposure occurs in a workplace setting and employers may be liable for any consequent illness. If you feel that you may have grounds for claiming compensation, you should speak with a personal injury solicitor to discuss your rights and options. The parietal pleura is the outer membrane that lines the inside of the ribcage. The inner membrane covers the lung and is called the visceral pleura. In a healthy body these membranes are right next to each other, with a small space – the pleural cavity – between them. A tiny amount of fluid lubricates their surfaces and this assists breathing because the two membranes slide over each other with the expansion and contraction of the chest. When asbestos fibres are ingested into the body they can become lodged in the pleura and cause scarring, hardening and thickening. If excessive fluid develops in the small pleural space between the parietal and visceral pleura it can cause symptoms of chest pain and breathlessness ("pleurisy"). If thickening of the pleura is widespread, this is known as diffuse pleural thickening. Because the pleura becomes so thick, it prevents the lungs from expanding as far, which is what causes the feeling of breathlessness. However, the British Lung Foundation (BFI) notes that the symptoms are not often severe. But that's not to say serious cases don't occur, and it may be necessary for the sufferer to undergo an operation to remove part or all of the thickened pleura. If the thickening of the pleura s minor and only occurs in tiny patches, then the condition is called pleural plaques. The good news is that Pleural plaques are benign (not cancerous). According to the BFI, developing pleural plaques does not increase the risk of developing a more serious disease, such as asbestosis, mesothelioma, or lung cancer. The BFI also says that in almost all cases of pleural plaques, the sufferer doesn't experience symptoms and may not even realise they have it. But in some cases the condition can still create a burden for the sufferer. First, the excess fluid itself, as well as pleural thickening, may cause permanent compression and distortion of the neighbouring lung tissue reducing the volume of healthy lung. Secondly, thickening of the lung can have a tethering effect on the underlying lung, reducing the elasticity of the lung and making breathing more difficult. Thirdly, the two layers of pleura can fuse, stiffening the chest wall and making breathing more difficult. If you're experiencing breathlessness, coughing, and chest pain, you should always speak to your doctor. Many of the people who claim compensation for pleural thickening do so because of the breathlessness and pain they experience. Any compensation awarded should reflect this reduced quality of life. However, as is common with asbestos-related illnesses, it may take between 15 and 20 years following exposure for symptoms to develop. 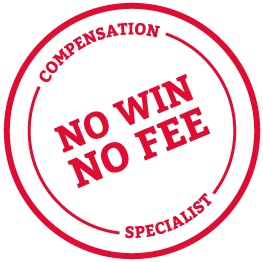 For FREE advice regarding the possibility of making a pleural thickening compensation claim call our lawyers today on 0800 0891331. We are the leading firm in Scotland and win more than 90% of the cases we take on.